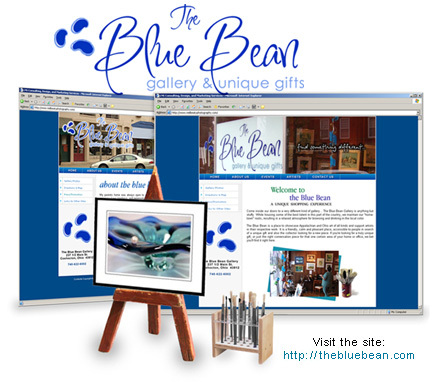 The Blue Bean is a place to showcase Appalachian and Ohio art of all kinds and support artists in their respective work. It is a friendly, calm and pleasant place, accessible to people in search of a unique gift and also the collector looking for a new piece. If you're looking for a truly unique gift, or just the right conversation piece for that one certain area of your home or office, here's where you can probably find it. LNS worked hard to create a presence for this very atypical, very unique gallery. it was important to convey its relaxed atmosphere for browsing and drinking in the local color. We believe we created a site for visitors to get a feel for this gallery's mission.